Celia was baptized on Sunday. We were happy to celebrate such an occasion on a festive holiday weekend. But, I’ll be the first to admit: This party was anything but a shortcut. We transported a full Baptism celebration for 30-40 people to the state park near our house where we rented a pavilion and spent the beautiful day outside. I was reminded continually as we prepared for the bash that I have entered into a mixed marriage. Myself, a crafty shortcutter, has married a non-shortcutter. Michael is a great cook and goes to great lengths to make sure each dish is cooked just right and tastes divine. 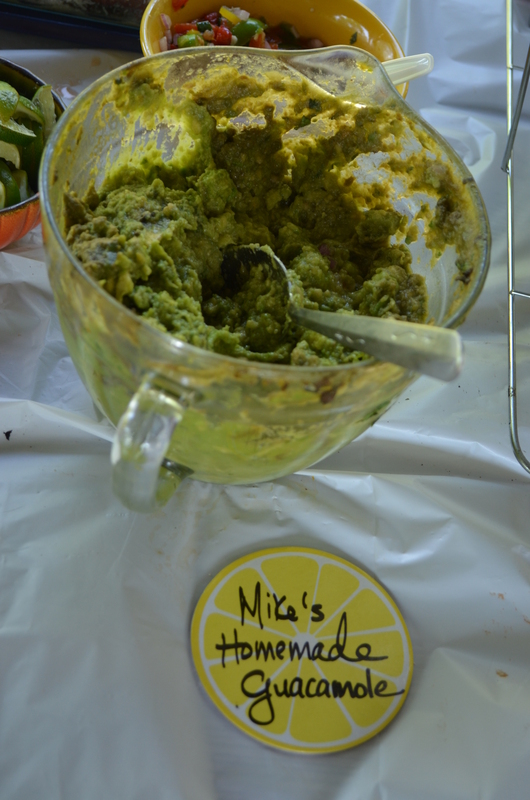 He made both homemade guacamole and two kinds of homemade salsa. His ability to layer flavor and bring ingenuity and originailty (I learned these terms for critiquing food on Top Chef) to each thing you taste. b. Don’t criticize the lengths he goes to because surely you will be sorry. His “extras” always end up people’s favorites. We have a small home so having parties is always interesting. We have hosted many different parties over our eight years together and each one seemed to impress upon me one thing: When Michael does a party, he does it big. Where I would like to pull snacks our of the fridge and open a couple bags of chips, he wants to have a made to order meal ready to go. When it comes to parties and that party frame of mind, we could not be more different. We knew we wanted to have a big family gathering for Celia’s Baptism. 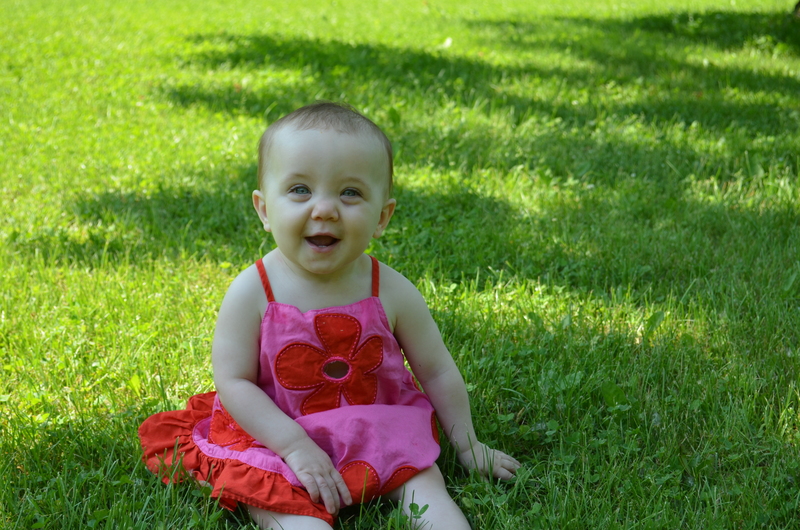 We planned it for the Spring even though she is 9 months old in order to have the best weather and be able to have the party outside. We were lucky to have a wonderful day of sunshine and a cool breeze. Kids ran around playing lacrosse and other games they invented and we all got to eat, eat, eat. It was an epic feast. When Mike is the meal planner, we never have to worry about having good food to eat. Mike spent a good part of the day on Saturday slicing, dicing, marinading and trimming meat. It smelled awesome and was well worth it! The food was great! 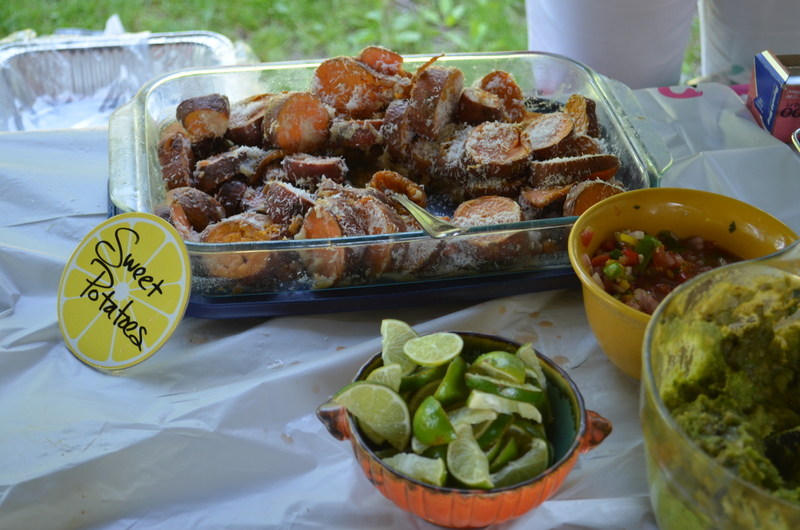 We admit that the party had a little bit of an identity crisis (Luau decorations, Mexican entrees and Jambalya?) but no one seemed to notice. We found ALL the decor at our local dollar store or at the dollar section of Target- everything was great, cheap and will double as awesome summer get together decor in the coming months. We decorated the tables with leis and Luau lawn ornaments. We purchased a good amount of our paper products, drinks, meat and produce at our local Wholesale club. It’s really the only way to get the quantity you need for a big party. 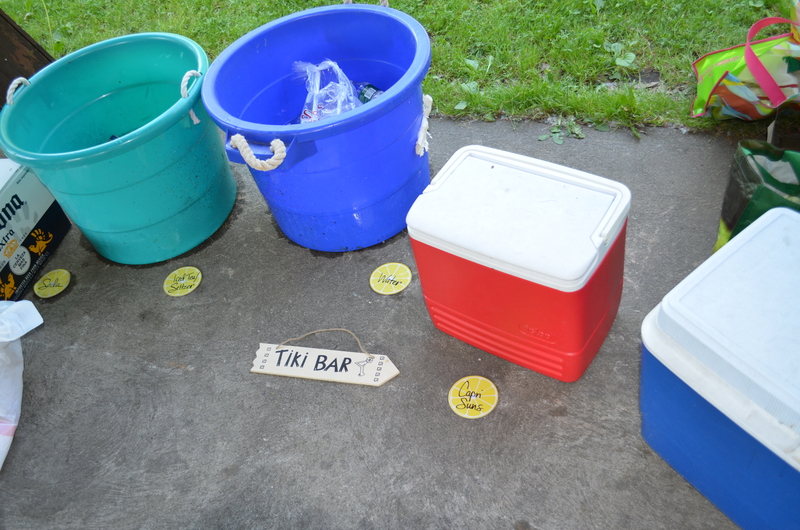 Years ago, we invested in chafing pan holders for our engagement party and again used them for this event. This helps keep food hot for the entire party as people come and go. All you need is to buy some sternos to do this. We rented a pavilion which makes the whole cleaning the house x2 thing a non-issue. There were bathrooms right on the premises and plenty of room for all the kids to play and have room to run. With kids ranging from 8 months to 11 years of age, there were a lot of little people to entertain. As a keepsake of the day, I bought a nice frame at Target and had everyone at the party sign it. I plan to put Celia’s Baptism picture in there and hang it in her bedroom. This was a nice way to record all the people that were there for her that day. 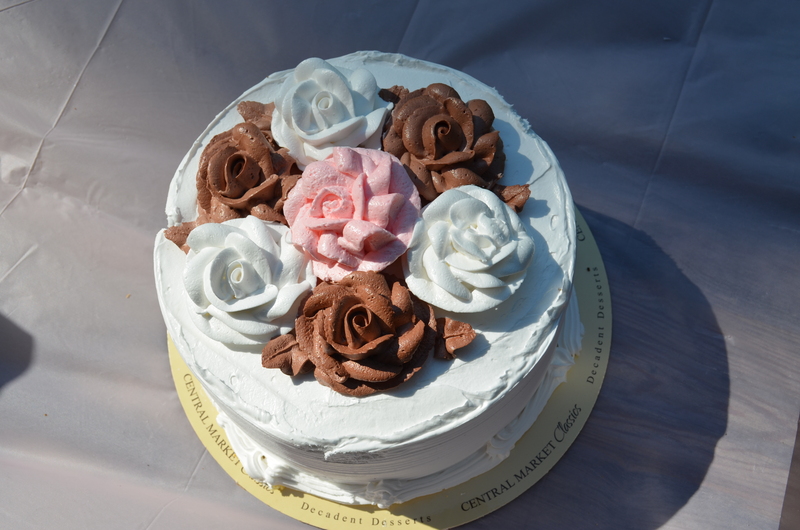 (Shameful Shortcut): I messed up the cake royally and had to purchase a cake the day of. I found our local supermarket had great “gourmet cake” options. This was not the most thrifty choice, but it turned out to be a great choice for the taste! Everyone loved the cake. Upon reflection on this mixed marriage, I have noted this: When we have a party, celebration, special occasion, milestone, accomplishment, etc, some of us can do them with a cheese, crackers and a liter of diet coke. Some people want something more extravagant, gallant, elaborate, beautiful. Where I have the “let’s keep it simple” approach, Michael has the “let’s show ’em what we got” approach. And, in saying that, I have decided that nothing makes me happier in life than being married to Michael— his non-shortcutterness and all. Celia still showing her post Baptism glow. 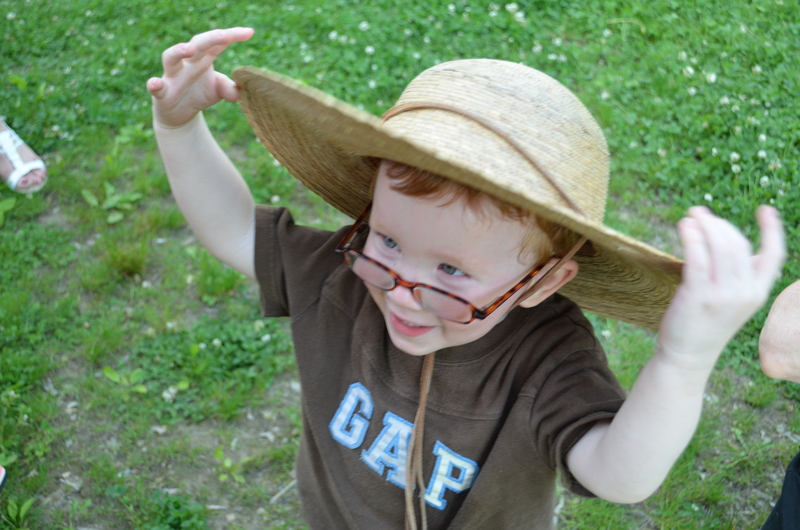 My little man had an awesome time with all of his cousins! 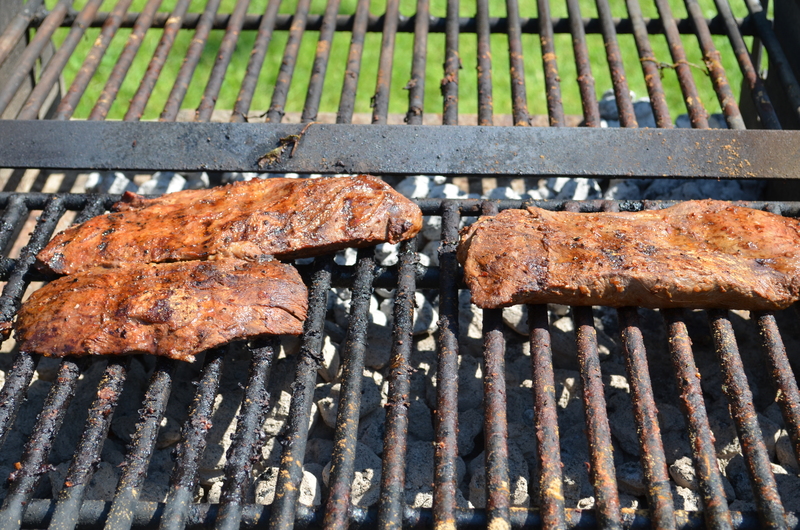 Steaks hot on the grill! My big cheat— the cake! My sweet potatoes, with coasters I found at Target that I used as menu descriptors. 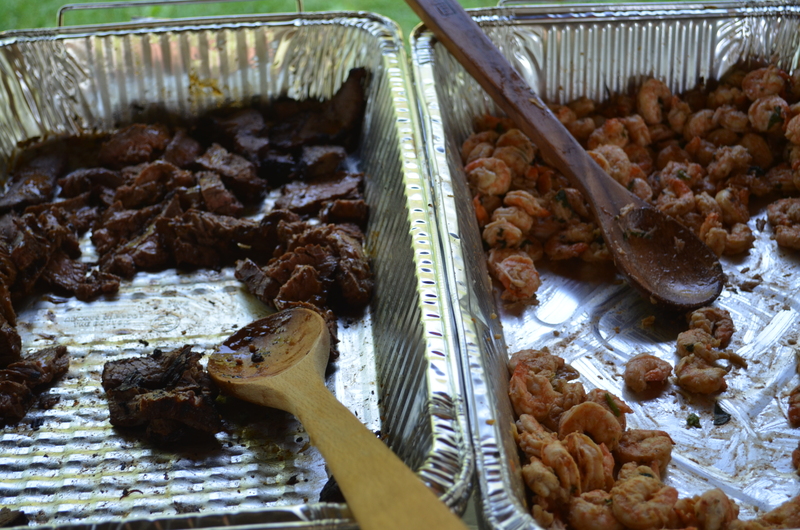 The steak and the shrimp! 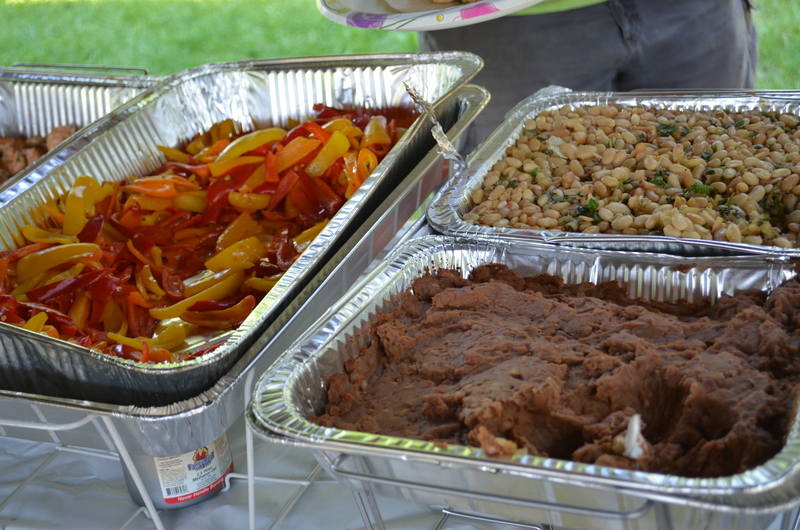 The peppers, Hawaiian baked beans and refried beans– we had it all!